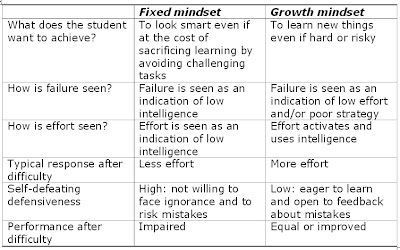 Clearly the growth mindset is more attractive in many ways. 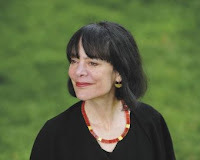 The chapter gets even more interesting when Carol Dweck goes on to a practical level. How can educators and parents help children develop a growth mindset? In particular, what is the role of praise? Two forms of praise are compared: process praise and trait praise. With process praise you compliment the child with his or her effort or strategy ("You must have worked hard", or: "You must have used a good strategy to solve this"). With trait praise you compliment the child for a trait, some kind of fixed internal quality ("You have done well, you must be very smart."). 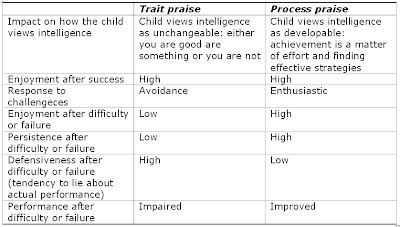 The table below shows the different impacts these two styles of praising children have. Very interesting, don't you think? This I DEFINITELY want to read!!! I can see using this with adults too. When I think about some of the most obstinate resisters to change (that others want), for example some of the union leaders I have had to facilitate, I could see thinking of them in a growth vs. fixed mindset. He sat silently through two days of the workshop. Normally, he would have interrupted and slowed down the process. He must have been in growth mindset, albeit silently. Hi Alan, oh yes it works with adults too. Especially indirect processs compliments!